Vegetarians! Vegans! Low Carb People! Avert your eyes! 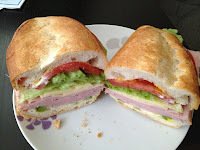 This blog is full of deli sandwich goodness! You have been warned! 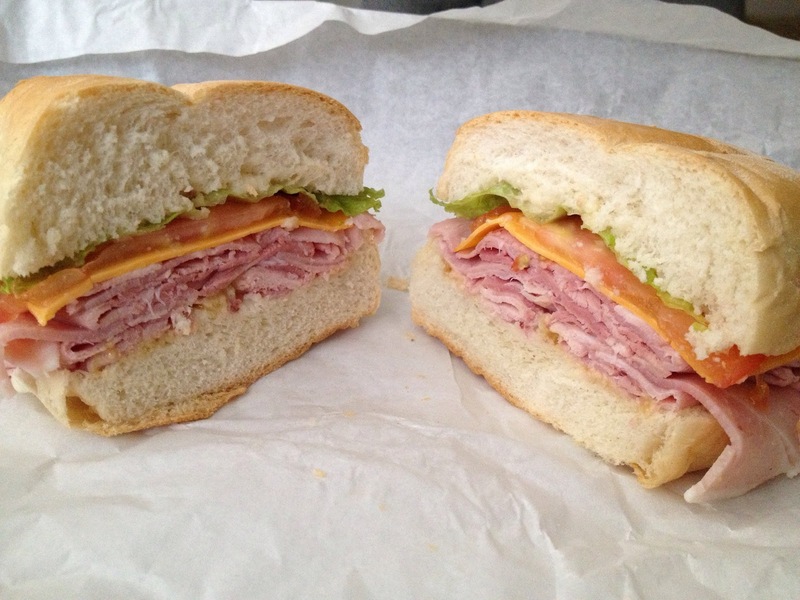 Deli sandwiches come in all shapes and sizes. I have a special place for them on my thighs. Instead of doing a separate blog for individual deli experiences, I've put them into one handy dandy blog for your carb enjoyment. Each meal I took home and they were all under $10! Here is the Cambridge edition of deli delights. I love em so much, I have to separate them by city! The family that owns this place make you feel like they know you as soon as you enter. They were so welcoming! This is an Italian deli, not your typical deli. They also serve homemade pizza, panzarottis and salads. I asked the matriarch what was good. 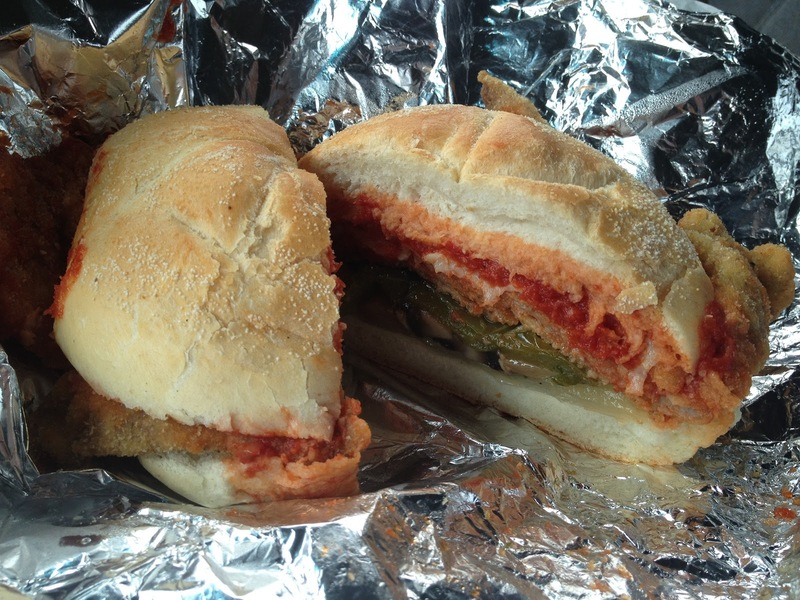 She suggested the veal cutlet sandwich. Toppings are extra. I got all of them, cheese, sautéed peppers, mushrooms and onions. What a sight for hungry eyes. When she handed me the sandwich, she warned me I would not be able to finish. She was right. The cutlet was thin, but the sauce had big flavour and the fresh bun soaked it up nicely. Delicious! This establishment does it all, groceries, meat counter, deli counter, bakery, frozen foods. Oh my! It was a zoo! I waited 15 minutes or so to be served, but it was also Saturday. Upon walking in, I was enveloped by the scent of fresh bread. Excellent start. I took a number and browsed. They make fresh pizza, deserts and pies too! Focus Lisa! FOCUS! I went with black forest ham on a fresh Italian bun. They didn't skimp on meat or toppings, but for $5.99, you got the sandwich, small pasta salad and a pop! Great deal! The meal did not disappoint either. In case you were wondering, I couldn't finish this one either, but I blame the pasta salad for that. After moving to their snazzy new location, I decided to pay Honey Ham a visit. Their new location has a large seating area for dining in and an area near the entrance for take out customers. They also sell their famous honey mustard and other sauces near the entrance. They also take catering and spiral sliced honey ham orders. I ordered a Classic Honey Ham sandwich with everything on a kaiser. I see why that honey mustard is so famous; it packs a punch! The bun and toppings were all very fresh and I was not disappointed by the generous amount of honey ham. It was a great sandwich, but they put a ton of honey mustard on it. That's a lot of punch! Did I finish this sandwich? Almost! Know of a better deli? Leave a comment and I'm there!